We want to interpolate an hypersurface in the dimension . We have a set of interpolation points on the surface. We must be sure that the problem is well poised: The number of points is and the Vandermonde determinant is not null. We will construct our polynomial basis iteratively. Assuming that we already have a polynomial interpolating points, we will add to it a new polynomial which doesn't destruct all what we have already done. That is the value of must be zero for . In other words, . 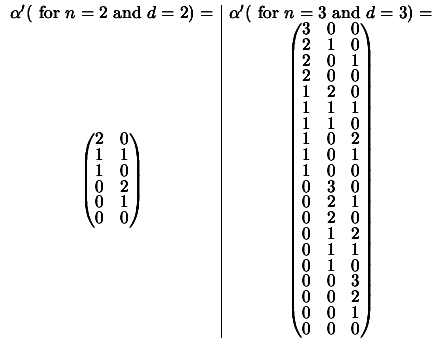 This is easily done in the univariate case: , but in the multivariate case, it becomes difficult. We must find a new polynomial which is somewhat ''perpendicular'' to the with respect to the points . Any multiple of added to the previous must leave the value of this unchanged at the points . We can see the polynomials as ``vectors'', we search for a new ``vector'' which is ``perpendicular'' to all the . We will use a version of the Gram-Schmidt othogonalisation procedure adapted for the polynomials. The original Gram-Schmidt procedure for vectors is described in the annexes in Section 13.2. We will take each and remove from it the component parallel to the current polynomial . Loop increment . If go to step 2. After completion of the algorithm, we discard all the 's and replace them with the 's for the next iteration of the global optimization algorithm. If we don't manage to find a point such that , it means the dataset is NOT poised and the algorithm fails. You can see that we retrieve inside this decomposition of the algorithm for the evaluation of the polynomial , the coefficient in the same order that they appear when ordered in ``inverse lexical order''. Let us define the function . This function takes, as input, the index of a monomial inside a polynomial ordered by ''inverse lexical order'' and gives, as output, the index of the same monomial but, this time, placed inside a polynomial ordered ''by degree''. In other words, This function makes the TRansformation between index in inverse lexical order and index ordered by degree. : number of monomial inside a polynomial of dimension and degree . : the coefficients of the polynomial ordered by degree. In the program, we are caching the values of k and the function TR, for a given and . Thus, we compute these values once, and use pre-computed values during the rest of the time. This lead to a great efficiency in speed and in precision for polynomial evaluations.